Get ready, the new Portillo's coming to the South Loop is just a month away from opening. 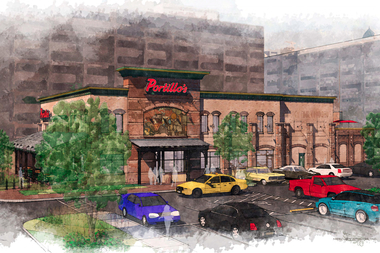 The restaurant will open May 31 at 520 W. Taylor St., Portillo's spokesman Nick Scarpino said. Once open, the eatery known for chocolate cake shakes and Chicago-style fare will be the second in the city following a longtime River North spot. As a reminder this was confirmed back in September of last year. This definitely seems like a big boon for the neighborhood and the shopping area west of the Chicago river specifically. Toss the Hair on East 13th Closing on June 1st?